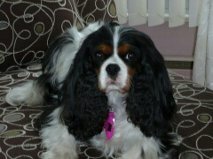 December’s patient of the month is Ms Bunny Carson, a bubbly and adorable Cavalier King Charles Spaniel. Bunny has been coming to see us at Oak Animal Hospital since 2009. Ms Bunny was adopted by her mom, Lorraine, when she was 4.5 years old. She had just finished working on the film, Dr. Doolittle 4 (Tail of the Chief). She was playing the US president’s dog- her voice in the movie is played by Actress Jennifer Coolidge. After that, Bunny was retired from film. Prior to her film career she had won her title and was a champion breeding dog. She is of course most happy in retirement, living the life of luxury. In 2011, at the age of 8, it was noted that Bunny had developed a grade 3/6 heart murmur. At this time it was recommended by Bunny’s doctor, Dr. Ong, that Bunny undergo a cardiac workup. Digital radiographs, as well as a cardiac ultrasound were performed. These revealed that Ms Bunny had a mitral valve insufficiency and prolapse, with mild tricuspid insufficiency. This heart condition would require some new medications and frequent monitoring. Ms Bunny continued to see us at Oak, but was also referred to a cardiologist at Canada West Veterinary Specialists. Late in 2012, Bunny’s condition progressed to congestive heart failure. Her loving mom, Lorraine has been doing an absolutely fabulous job of managing her condition throughout and Bunny is continuing to do very well. Miss B will be 11 in April 2014 and we are thrilled to have had the pleasure of treating her for all these years!